Surrounded by the Pond at the southeast corner of Central Park is the four-acre Hallett Nature Sanctuary, a peaceful haven just feet away from some of Central Park's busiest paths. Hallett Nature Sanctuary is one of the Park's three woodlands (along with the Ramble and North Woods). It was originally called "the Promontory" by the Park's designers. The underused and inaccessible landscape was closed to the public and preserved as a bird sanctuary by NYC Parks Commissioner Robert Moses in 1934, and in 1986 renamed in memory of George Hervey Hallett Jr., a birdwatcher, naturalist, and civic leader. The sanctuary remained untouched until 2001, when the Central Park Conservancy took up its restoration and maintenance. 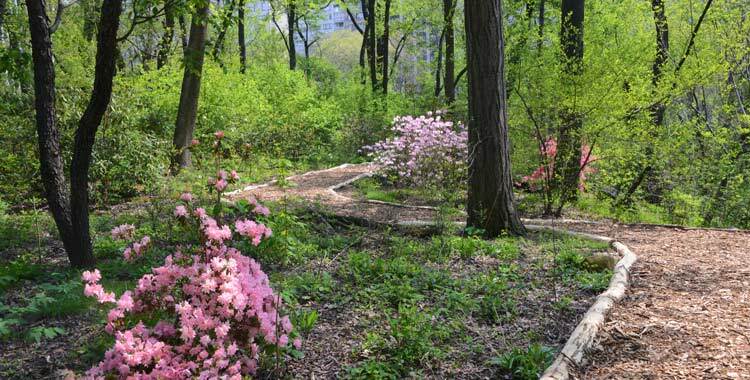 Hallett Nature Sanctuary is a perfect example of how even the "wildest," most naturalistic habitats in Central Park require constant planning and care in order to thrive. As a result of the Conservancy's removal of invasive plant species and introduction of native plants, the sanctuary is more diverse and healthy than ever, supporting various wildlife populations. The absence of visitors played a large part in the Conservancy's successful restoration of the Hallett Nature Sanctuary. In fall 2013, the Conservancy began offering open hours in the sanctuary, a rare opportunity to explore one of Central Park's best-kept secrets and learn about what it takes to revitalize and care for a seemingly natural landscape. You can explore the Hallett with Conservancy guides on an Official Tour. The Hallett Nature Sanctuary is open daily from 10:00 am until 30 minutes before sunset. Sorry, no dogs, bicycles, or strollers are permitted. Closures: The Hallett may occasionally close temporarily for inclement conditions or special events. Please check our Alerts and Closures page for any changes to the schedule. Sign up to receive email notifications about upcoming tours and the inside scoop on Central Park events. coming tours and the inside scoop on Central Park events. The Hallett is located south of Wollman Rink. Enter at Sixth Avenue and Central Park South (closest Park entrance): Go down the stairs between the Conservancy information kiosk (left) and the statue of Jose Marti on his horse (right). As you approach the Pond at the bottom of the stairs, turn left. Follow the path up the hill. At the intersection, turn right, and shortly after, the gate will be on your right. East Side from 60th-62nd Streets just south of Wollman Rink.